As world leaders gather at the United Nations climate change conference in France, the University of Florida is working to decrease its carbon footprint at home. Megan Walker-Radtke, program coordinator at the UF Office of Sustainability, is helping the university shrink its carbon footprint and reach carbon neutrality by 2025. She said the university is working with We Are Neutral, a nonprofit organization that helps communities and businesses reduce greenhouse gas emissions and offset remaining emissions. UF’s sustainability plan includes the use of a cogeneration power plant, which would use wasted heat from campus buildings to heat other buildings, Walker-Radtke said. This would make the plant 70 percent efficient, while a non-cogeneration power plant is only 35 percent efficient. She said the university is also working closely with vendors at Ben Hill Griffin Stadium to ensure it uses only compostable materials. Currently, volunteers sort through trash to separate compostable from recyclable materials during and after football games, she said. But the goal is a “zero-waste” stadium, in which only recycling and composting bins would be provided. Walker-Radtke said reducing the use of anything that requires energy consumption could help. Use less water, turn off lights and use efficient modes of transportation, she said. “A lot of these things are built into our system. Our society has grown up around the assumption that fossil fuels are cheap and available and don’t have consequences,” she said. She also recommended wrapping insulation blankets around water heaters and focusing on maintaining a healthy, sustainable diet. Walker-Radtke said she hopes these personal and institutional efforts will help slow the world’s pressing climate-change problem. The Intergovernmental Panel on Climate Change (IPCC) has determined global warming temperature increases of more than 2 degrees Celsius would have serious consequences, including a significant rise in extreme climate events. Now, scientists have a very different goal. Walker-Radtke said scientists have stopped pondering the possible effects of global warming and are now examining solutions to stop its advancement. Abhaya Thiele, second from the left, poses with other Citizens Climate Lobby members after visiting a member of Congress this summer. Photo courtesy of Abhaya Thiele. Abhaya Thiele, coordinator of the Gainesville Chapter of Citizens Climate Lobby, said she believes political action is the most important thing an individual can do to combat climate change. The organization works on national legislation to reduce greenhouse gas emissions. 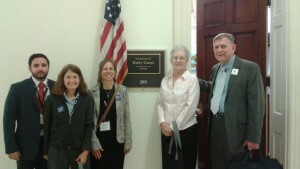 Thiele and other participants meet with members of Congress and other legislators to advocate for political and legislative change. They also write op-eds and letters to newspaper editors to tell the public why these legislations are necessary to reduce greenhouse gas emissions. She said the organization is pushing to create a steadily rising carbon fee on oil, gas and coal to make fossil fuels more expensive over time. This should help the economy transition to cleaner sources of energy, she said. Thiele mentioned she has noticed a marked difference in the dialogue between the organization and political leaders, particularly with Republican members of Congress. She said they are now more willing to talk about solutions to climate change. She said 12 members of Citizen’s Climate Lobby are currently at the conference in France lobbying for a carbon fee. She encourages individuals from local communities to engage in the political process and show others the urgency of taking national political action. Laura is a reporter for WUFT News and can be contacted by calling 352-392-6397 or emailing news@wuft.org. Thanks to CCL for their support of a carbon fee and dividend.A revenue neutral carbon fee with a dividend, makes enormous sense! Economists and scientists say it is the best solution to the threat of our carbon emissions. This way citizens would RECEIVE the carbon fees as a monthly dividend. That would cancel out any price spikes in dirty energy. Polluters PAY the fees, so it holds fossil fuel corporations responsible for the damages they cause, hundreds of billions of dollars per year (Harvard School of Medicine). It would rapidly lower emissions, as happened in BC Canada with a similar policy. BC lowered both emissions and taxes with their fees. A study by respected Regional Economic Modeling, Inc. found the dividends would help to create 2.9 million additional jobs in 20 years, while reducing emissions much faster than regulations. your mind. But what have you got against cleaner air, less asthma in our kids, fewer heart attacks, and more money (the dividend) in your pockets? limit the problem of climate change is worth it. For example: the cost of sea level rise ALONE is so great that no effort to prevent it is unwarranted. Why even bother with the paid deniers who thrive creating the delay of a false debate?